The fast paced movie guessing game! The joint will be jumping at your next party when you break out this fun and exciting Pass the Popcorn Game. It's a riot! Tiles tell you which clues to use to help you race to finish all your tiles before someone else completes theirs! Features 240 of the biggest box office hits, award-winers, fan favorites and film classics. 2 to 8 players or teams. 30 minutes. Ages 12 and up. 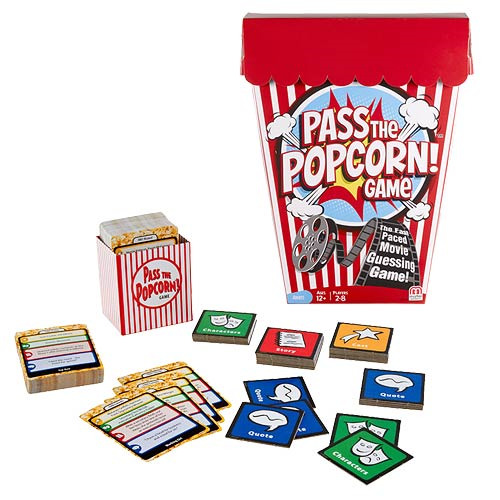 Pass the Popcorn Game includes (subject to change): 120 movie cards, 32 game tiles.